Leap into a world where fashion is fun and jewellery is unforgettable. This animated design takes your look on a fantastical adventure through the magic of sparkling crystals and showstopping silhouettes. You'll be mesmerized by its beautiful allure. 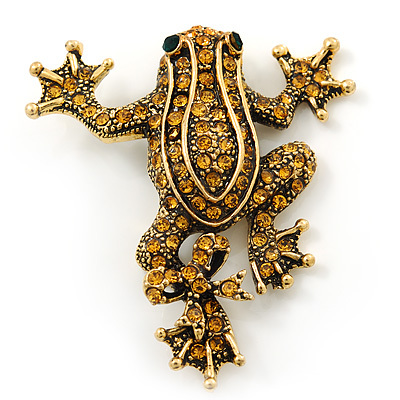 Featuring a frog shape design, crafted in gold plated metal and pave set with sparkling citrine coloured crystals. The eyes set with two emerald green stones. The brooch measures about 45mm x 50mm and fastens with a flag pin and revolver clasp. Attach the cute style of this cool brooch to your jacket, coat or even bag.